This past month, Kevin Shenderov, a fourth-year medical student, was honored with the Philip A. Mackowiak Award for Medical Student Excellence. This award honors a Maryland medical student in the American College of Physicians (ACP) who has made significant contributions to promoting internal medicine, scholarship and academic excellence among his or her peers — all things Shenderov has done in abundance. Shenderov joined the ACP and the Internal Medicine Interest Group (IMIG) as a first-year medical student. During his second year, he joined the board. He describes IMIG as a group that informs students about what internal medicine is and the various career paths available, ranging from primary care physician to hospitalist to academic and research careers. A goal of the group is to provide a forum for discussions regarding clerkship advice, mentoring and academic papers, accomplished through IMIG’s associated journal club. While IMIG receives traditional funding through the school of medicine, it also receives funding from the ACP. Shenderov is part of the ACP student board and helps to plan events, such as the ACP student conference and interschool socials. Aside from the student ACP meetings, Shenderov regularly attends the ACP physician meetings. 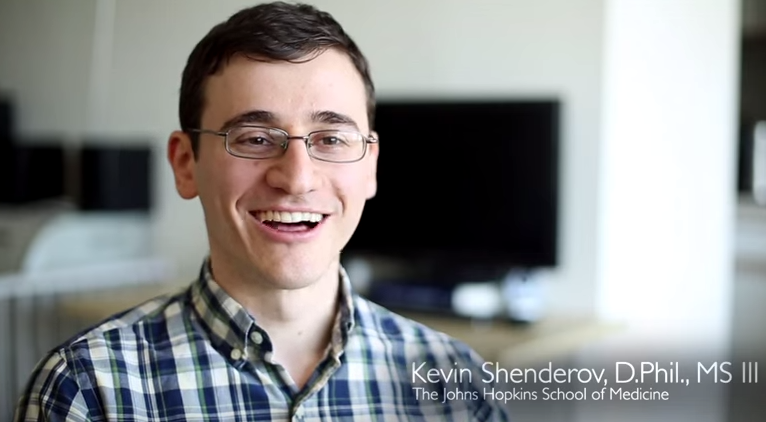 Shenderov, a Rhodes Scholar, started the M.D. portion of his M.D./Ph.D. after finishing his doctorate in immunology at Oxford and the National Institutes of Health. At the time, he had an inkling that he would likely pursue internal medicine. During his Ph.D., he realized that as a physician, he wanted to do something clinically that related to the immune system. He quickly found during his rotations that, while almost every specialty had a degree of immunology, none were more involved, or as appealing to him, as internal medicine. Over his years in graduate and medical school, Shenderov found many valuable mentors, notably Alan Sher at the National Institutes of Health, Vincenzo Cerundolo at Oxford, immune-oncologist Jonathan Powell, infectious disease specialist Khalil Ghanem and rheumatologist Allan Gelber. Working with these individuals convinced him he would enjoy internal medicine with an immunology-based specialization after and also reinforced the value of excellent clinical teaching and mentorship.